The latest in the Play Guitar Now series, Learn To Play Ukulele, hits shops today. Bursting with everything you need to get playing the world's hottest instrument, Learn To Play Ukulele includes a magazine packed with playing tips and tutorials and DVD with step by step lessons. 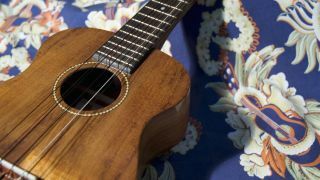 You'll learn all the chords and shapes you'll need to get started on your journey to mastering the ukulele, and get the inside track on the techniques used by uke masters like Jason Mraz, George Harrison and Jack Johnson. • Rhythm & Lead - Learn strums, melodies and four great pieces. • Fundamentals - The basics of the Ukulele to you started. • Also included a DVD with step-by-step lessons to take you through your first steps! Play Guitar Now: Ukulele is available now from WHSmiths and all good newsagents, or you can order a copy online. Now get strumming!